GOD loveth mankind! HE gave us HIS SON+ Who+ gave us the GIFT of Life. LORD GOD might dwell among them. Our LORD JESUS CHRIST robed Himself+ in our human flesh … so that we might be robed in His+ Divine Righteousness. Regardless of the date of the Incarnation of CHRIST JESUS in human flesh… HE+ DID COME … at the fulness of time, at the Time so Appointed by The FATHER, for which we all give thanks ! The LORD JESUS had much WORK to take upon Himself+ when HE+ came. Furthermore, this DIVINE work could only be accomplished by His+ coming in the flesh as the SECOND ADAM+ . Because that is what HE+ did when HE+ came here, we can now be robed in white linen, pure and clean … pure and clean as a newborn babe in all its innocency. Because HE+ came, we who seriously follow JESUS become un-stained from sin. We are made New Creatures in CHRIST. Our FATHER sees the Prodigal from afar, returning to HIM … through CHRIST JESUS. We too are arrayed in the “Best Robe” of the Prodigal , that special Robe handed to us by our Gladsome FATHER. The great JOY that occurs in Heaven when we repent will over-flow into our own hearts here on earth ! 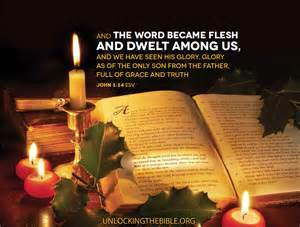 Because The LORD JESUS condescended to be born in the flesh, we can be born from Above, Anew, Again. we can go UP ! Even more, we do NOT have to wait until we die to have companionship with the LORD. That companionship is ours NOW… because HE+ came as EMMANUEL, GOD with us. I will greatly rejoice in The LORD! with the garments of Salvation.